A bachelor’s degree in an engineering related field is preferred. 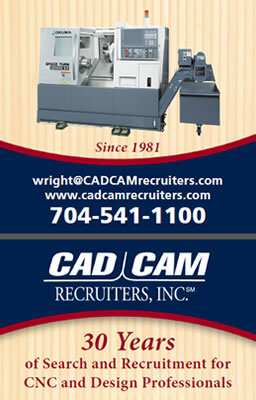 The applicants should have a strong manufacturing background. The ideal candidate will have a working knowledge of modern multi-function CNC machines (Mazak Integrex Okuma Multus, Mori NT, Matsurra etc, etc.). Successful candidates must possess a demonstrated understanding of computer programming fundamentals, Post Processor development and operating experience. Strong problem solving skills are essential. The applicant must have legal status to work in the US. competitive compensation and a generous benefits package including medical and dental insurance, paid vacation and company match 401K contributions.